Celebrities are THE fashion icons for beauty, makeup — and of course, hairstyles. Carrie Underwood is no exception. 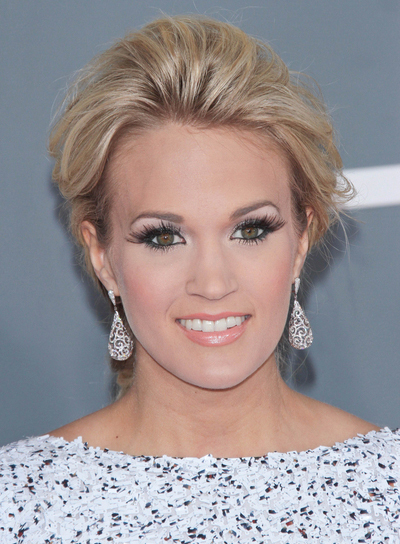 That’s why we’ve got Carrie Underwood photo galleries, pictures, and general beauty news on this celeb. Her style is totally inspiring and worth checking out. So if you’re searching for some beauty tips, hairstyle options, and fashion advice, turn to Carrie Underwood. She’ll bring your fashion to a whole new place. 1. 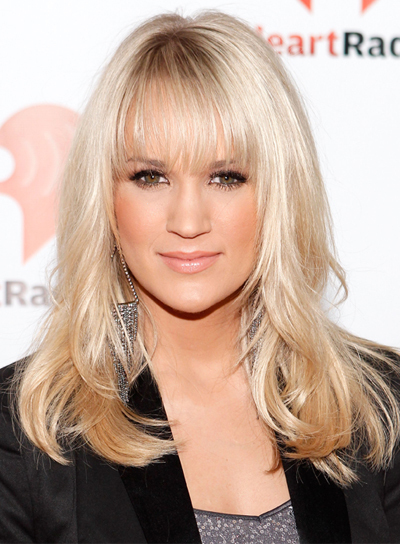 To get Carrie Underwood's hairstyle, part your hair down the center as soon as you get out of the shower. 2. Apply styling cream to damp hair and blow dry your hair using a round brush to smooth it out. Flip out the top layers of your hair as you dry. 3. Once your hair is completely dry, use a 1 1/2-inch curling iron to curl the bottom half of your hair. Finger comb through your curls to separate them. 1. To get Carrie Underwood's hairstyle, begin by applying a straightening serum to damp hair and then blow dry with a round brush until your hair is completely dry. 2. Next, create a a deep middle part, and take 2-inch sections of your hair and curl them using a large curling iron. Begin the curl at eye-level and wrap the sections away from your face. 3. Continue curling the rest of your hair. If necessary, use a flat iron to wave bangs or front sections of your hair away from your face. 4. Finish by spritzing your hair with a flexible-hold hairspray. 1. Apply smoothing cream to damp hair and blow dry using a round brush. Blow out your bangs until they're nice and smooth. 2. Wrap large sections of hair near the front of your face around a 2-inch curing iron and twist outwards. Release curls and slightly finger-comb through them to release some tension. 3. Then curl the ends of your hair in smaller sections and finger-comb through them too. 4. Mist all of your curls with a light-hold hairspray to finish. 1. Mist damp hair with volumizing spray and blow dry using a round brush -- lift hair at the roots to add volume while drying. 2. Once your hair is completely dry, use a 1-inch curling iron to curl just the ends of your hair to add some grip. 3. Gather of all of your hair to the side, and twist your hair into a bun. Let a few pieces of hair fall out around your face, and secure the bun with an elastic. 4. Curl the hair around your face for romantic face-framing layers, and mist all over with lightweight hairspray to finish. 1. Since this style is for long, straight hair, start by smoothing shine serum through freshly flat-ironed hair. 2. Part hair deeply to the side and gather into a ponytail behind one ear, leaving out bangs and a 1- to 2-inch piece just beneath the pony. Secure tightly with an elastic. 3. Wrap the piece you left out around the pony and secure with a bobby pin (that should be hidden). 4. Smooth bangs over to the same side and pin behind your ear. 5. Use a curling iron on the ends of the pony for a lil' somethin' special. 6. Spritz the style with firm-hold hairspray. 1. 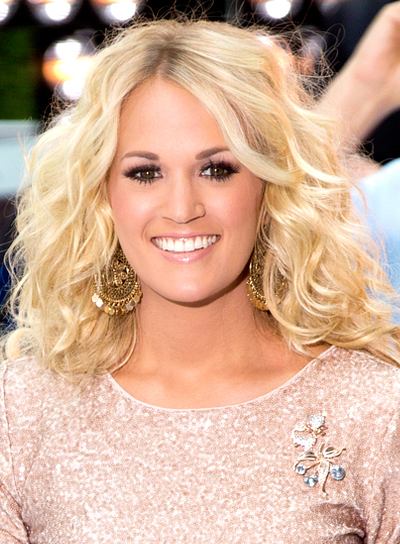 To get Carrie Underwood's hairstyle, apply a generous amount of volumizing mousse to the roots of your hair. 2. Flip your hair over and blow dry it to add volume. Once your hair is halfway dry, finish drying it with a round brush to smooth out your hair. 3. Use a 1 1/2-inch curling iron to curl the bottom half of your hair. This will add more hold for your updo. 4. Use your fingers to gather all of your hair into a low chignon, and secure it with an elastic or clip. 5. Leave out a few curls around your face, and mist all over with strong-hold hairspray to finish. 1. 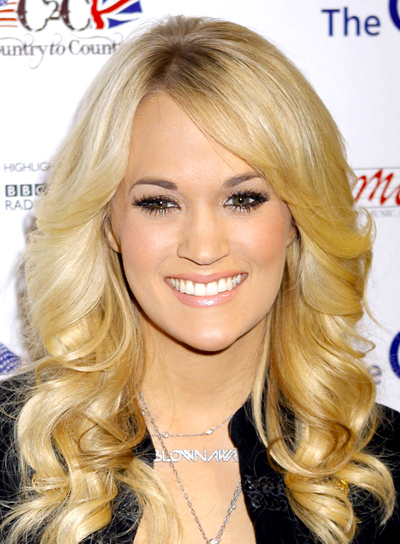 To get Carrie Underwood's hairstyle, start by applying a heat protectant to damp hair and blow dry using a paddle brush. 2. 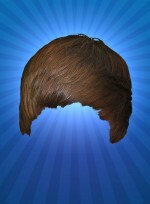 Next, create a deep side part and pull your hair over and behind one ear. Use a 1 1/2 -inch barrel curling iron to curl the rest of your hair. Clamp down and hold for a few moments before releasing. 3. Spritz a shine serum throughout your hair, then use your fingers to rake through your curls several times to create loose waves. 1. 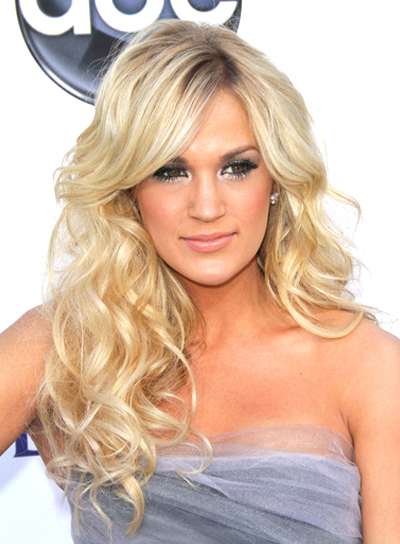 To get Carrie Underwood's hairstyle, mist damp hair lightly with hairspray and blow dry straight with a paddle brush. 2. Part hair to the preferred side and curl 1 to 2 inch sections of hair around a medium barrel curling iron. For extra hold, blast hair with holding spray while it's wrapped around the iron. 3. Gently Separate curls with your fingers and sweep all hair to one side, securing with a bobby pin. 4. Curl bangs to the side and spritz hair with finishing spray. 1. To get Carrie Underwood's hairstyle, apply a texturizing mousse to damp hair and blow dry using a diffuser for the ends and a round brush for your roots. 2. Once your hair is dry, create a middle part and then begin wrapping 1-inch sections of your hair around a styling wand. Make sure to start from the back of your head, wrapping as close to your roots as possible, and work your way down. 3. Continue curling the rest of your hair, and then piece apart your curls using your fingers. 4. Tame your face-framing strands by curling them down and away from your face. 5. Spritz a shine serum all over your hair, then finish with a flexible-hold hairspray. 1. 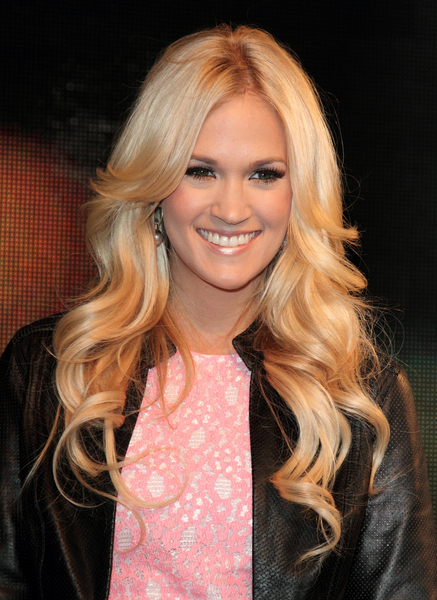 To get Carrie Underwood's hairstyle, apply a texturizing balm to damp hair and blow dry evenly using a round brush. 2. Create a slight side part and brush a shine serum through your hair. 3. Begin to curl your hair starting at eye level in 2-inch sections with a medium barrel curling iron. Make sure to curl away from your face. 4.Brush through your curls once and finish with a medium hold hairspray. 1. 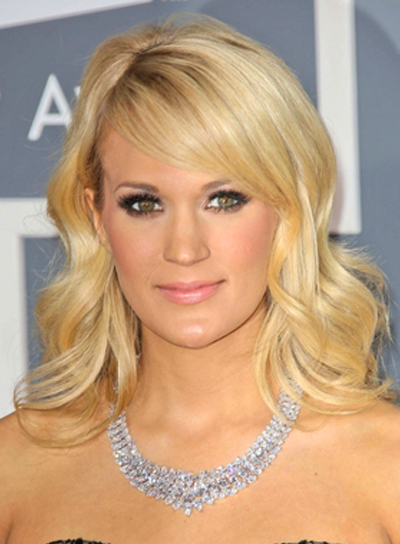 To get Carrie Underwood's hairstyle, apply a volumizing mousse to damp hair and create a side part. 2. Blow dry with a round brush. 3. Using a medium barrel curling iron, curl 1- to 2-inch sections of hair for long, soft curls. 4. While hair is wrapped around the curling iron, mist hair with a strong hold hairspray for curls that will stay throughout the evening. 5. Gently separate curls with fingers to loosen them. 6. Finish by spritzing hair with a shine spray to create a sheen and tame flyaways.